To Cite: Smyth J K, Nahm C B, Kuo S. Utilisation of Umbilical Hernia Defect for Insertion of Laparoscope and Balloon Dissector in Totally Extra Peritoneal Hernia Repair, J Minim Invasive Surg Sci. 2014 ; 3(3):e16076. Introduction: With the growing popularity of totally extraperitoneal (TEP) laparoscopic inguinal hernia repair, many surgeons will inevitably face the clinical conundrum of how to simultaneously repair an umbilical hernia and an inguinal hernia via TEP approach. Case Presentation: In this case report, we describe the successful use of the umbilical hernia defect to insert the balloon dissector and gas insufflator in the pre-peritoneal plane without making an additional fascial incision. Conclusions: We suggest that this best preserves the integrity of the umbilical hernia repair by avoiding an additional area of weakness in the rectus sheath. Given that both umbilical and groin hernias account for a significant proportion of outpatient presentations, the need for the simultaneous repair of both is a surgical issue likely to be encountered by most general surgeons. A longitudinal study of 8.104 US women suggests that those with umbilical hernias are more likely to suffer from groin hernias (hazard ratio 3.2, 95% CI 1.2-8.7) (1). At the time of repair of simultaneous umbilical and groin hernias, adding yet another fascial defect in the form of an anterior sheath incision for the purposes of laparoscopic inguinal hernia repair could compromise the integrity of the umbilical hernia repair. 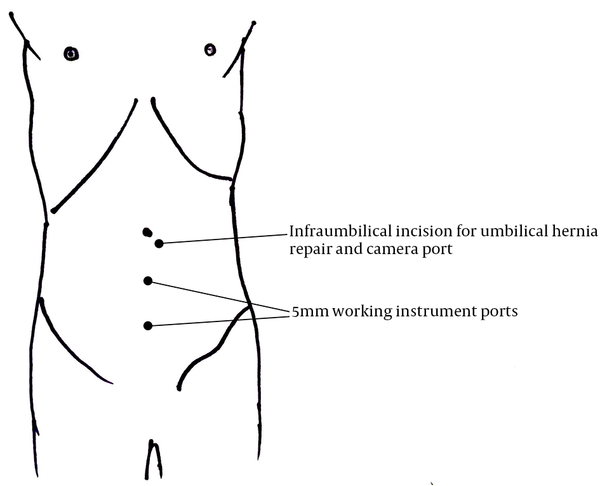 Here we describe and suggest utilisation of the umbilical hernia defect as a port of entry for the balloon dissector, gas insufflation port and laparoscope during total extraperitoneal (TEP) hernia repair so as to avoid the need for an additional incision in the adjacent anterior rectus sheath. A 45-year-old male with a body mass index (BMI) of 23 was referred to the surgeon’s clinic with a three-month history of synchronous umbilical and right indirect inguinal hernia. The patient had no history of previous abdominal surgery and had no significant medical comorbidity. Both hernias were readily reducible with supine positioning and manual pressure on examination and had a positive cough impulse. The patient was admitted to hospital for elective open repair of umbilical hernia and totally extraperitoneal laparoscopic inguinal hernia repair. 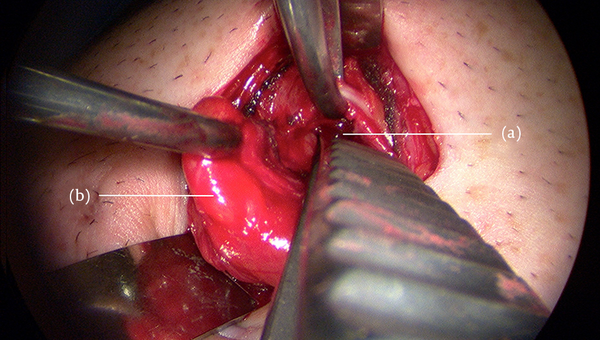 At the time of surgery, a 3 cm infraumbilical curvilinear incision was made and dissection performed down to the level of the umbilical fascial defect that measured 12 mm in diameter. The umbilical hernia sac was dissected from the fascial defect and returned to the abdominal cavity. A balloon dissector was passed through the umbilical hernia defect and then passed caudally in the pre-peritoneal plane down to the level of the pubic symphysis. The pre-peritoneal plane was successfully balloon dissected and insufflated with gas. The clinically evident right indirect hernia sac was dissected and reduced, taking care to preserve the vas deferens and testicular vessels, and a 12 × 15 cm polypropylene mesh was used to cover the hernia defect, Hesselbach’s triangle, and femoral ring. The laparoscopic ports and instruments were removed, the pre-peritoneal space deflated, and the umbilical hernia defect was primarily closed with two figure-of-eight 0-nylon sutures. The skin was closed with a subcuticular absorbable undyed monofilament 3-0 suture. The patient made an uneventful recovery, and was discharged the next day. At follow-up after one month, the patient was pain-free and there was no recurrence of either hernia. He has returned to all normal activities. There is currently no literature reporting synchronous open umbilical and totally extraperitoneal laparoscopic inguinal hernia repair. There is an isolated case report of synchronous single-site incision laparoscopic cholecystectomy and TEP inguinal hernia repair. However, in this instance the authors have utilised the conventional paramedian anterior rectus sheath incision to insert the balloon dissector for TEP repair, and subsequently incised the posterior sheath and peritoneum for Hasson cannulation of the peritoneal cavity for cholecystectomy (2). TEP hernia repairs can be used for inguinal, femoral, or Spigelian hernias (3-5). In the conventional TEP approach, the anterior rectus sheath is incised, the ipsilateral rectus muscle retracted laterally, a dissecting balloon introduced along the posterior rectus sheath, and advanced to the pubic symphysis (6). The posterior rectus sheath thins away inferior to the arcuate line (linea semicircularis), and the peritoneum is the only remaining posterior relation to the balloon. When the balloon is expanded, the pre-peritoneal working space is developed. The mesh is then placed laparoscopically to reinforce the hernia site (7). We suggest that if a patient has a concurrent umbilical hernia (Figure 1), the cicatrix should be divided, but the anterior rectus sheath should not be incised. Dissecting the hernia sac of the umbilical or paraumbilical hernia, and defining the fascial defect of the linea alba allows direct entry into the pre-peritoneal space (Figure 2). The balloon dissector can be inserted under the fascial defect but superficial to the sac and subsequently expanded to create a working space. The laparoscope and gas insufflation port are placed directly through the umbilical fascial defect into the same plane to carry out the TEP repair (Figure 3). After the TEP repair is completed, the umbilical fascial defect can be closed primarily or with mesh. The peritoneum and anterior rectus sheath are intact and preserved throughout the entire procedure. Both umbilical and groin herniae are repaired in an extra-peritoneal fashion. The rectus sheath does not need to be incised, and this is avoids an incisional weakness in the fascia by obviating the need for a fascial closure adjacent to the umbilical hernia repair. (a) Defect in the umbilical fascia exposing the pre-peritoneal space. (a) opening into pre-peritoneal space, (b) Hernia sac. Implication for health policy/practice/research/medical education: This is the first manuscript that instructs clinicians on how to deal with simultaneous repair of an umbilical hernia and an inguinal hernia a common clinical problem. Authors’ Contributions: Study concept and design: Nahm, CB; Kuo, S. Acquisition of data: Kuo, S. Analysis and interpretation of data: Smyth, JK; Nahm, CB; Kuo, S. Drafting of the manuscript: Smyth, JK; Nahm, CB; Kuo, S. Critical revision of the manuscript for important intellectual content: Smyth, JK; Nahm, CB; Kuo, S. Administrative, technical, and material support: Smyth, JK; Nahm, CB; Kuo, S. Study supervision: Nahm, CB; Kuo, S.